Atlantic Crane's OSHA inspection experts take the guesswork out of OSHA regulations and what is needed to keep your cranes operating safely and in compliance. Don't take the risk of non-compliance. Our technicians will ensure that your overhead material handling systems meet the following OSHA crane regulations and more. Inspection of cranes not in regular use. A crane which has been idle for a period of one month or more, but less than six months, shall be given an inspection conforming with requirements of OSHA 1910.179(j)(m)(2). A crane which has been idle for a period over 6 months shall be given an inspection conforming with requirements of OSHA 1910.179(j)(m)(2)(3). Call us at 610-366-1540 for more information or Request a Quote now for your specifications. Since 1984, we have specialized in the design and construction of safe and ergonomic overhead crane systems by top manufacturers. 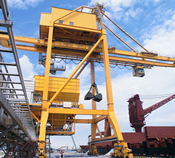 Atlantic Crane proudly serves the Delaware, New Jersey, New York and Pennsylvania region.